This is another oldie, but goodie. The last two stories have dropped into my lap, introducing me to these talented authors. Jane Kirkpatrick is now on my radar screen big time. "All Together In One Place" is the story of Mazy Bacon, a young wife, whose husband gets the urge to move out to Oregon. Although her mother accompanies them, she's a woman torn from the place where she's put down roots. Facing hardships crossing the prairie, the unthinkable occurs. A plague sweeps through the wagon train, killing most of the men. Will the widows press on toward California and Oregon or will they return home? Jane Kirkpatrick explores the personalities of these women, and reveals little by little what makes them tick. The setting, details, and practical duties of daily life flow from the author's pen through the vehicle of dialogue, internal monologue, and scenes. Within the romantic historical genre, this is the first prairie story I've read. As I sample the different sub-groups, my appreciation grows for the many authors represented. 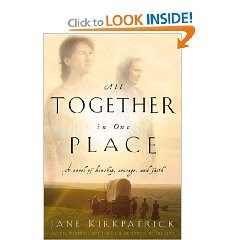 If you haven't already sampled Jane Kirkpatrick's books, I highly recommend this one. It was a good story though. Kind of sad. Woohoo! Thanks so much! Your timing is great. I was kind of bummed out because my job is ending July 17th. This really gave me a boost. My email is susanjreinhardt (at) gmail (dot) com. Thanks for stopping by. I'm thrilled about the award. What a blessing! I post here Monday, Wednesday, and Friday. I hope you'll visit again. I'm planning to get the other 2 books. It was sad, but the story and character development fascinated me. She did an awesome job. Reading your review, Susan, reminds me that I really do need to read more books in the historical genre. I don't recall reading any and I have no idea why I haven't. I tend to stick with my favorite genre's instead of branching out. Jane's book might be a good place to start if I ever get caught up on my reading. The cover reminds me of Little House on the Prairie. I'll have to check this one out. Thanks for spotlighting it! Congratulations on winning Terri's award. You deserve it. And she's a good writer, if I remember correctly. Your recollection is correct. She did a great job of getting me into the story, stayed on course with POV, and made me want more, more, more (as the commercial says). Until I started blogging, historicals weren't part of my reading diet. I decided early on to sample them, and I'm glad I did. There's a wide variety to satisfy any taste. Regency romances for the Jane Austen soul appeal to many, while stories about the American West abound. We're even seeing a number from the 20th century. I never thought about it, but you're right. Unlike Little House, the characters are on the move. The inspiration for Jane's story was a true account about 11 women traveling across country alone. The author notes at the end were almost as interesting as the book! I'll put this on my to-reads... God bless! Thank you for stopping by and for writing with excellence. I'm looking forward to reading more of your books. Thanks for the thumbs up for Jane. The way she developed each character was amazing. I can't wait to read your book. The small excerpts and your interviews have me wanting the whole thing.